The European Pact 4 Youth is an initiative of CSR Europe and it calls for all companies, social partners offering educational services and other stakeholders to create and consolidate partnerships in support of the youth inclusion and employment. In the process of creating the National Action Plan the Bulgarian network of the United Nations Global Compact consolidated views, good practices and ideas given from representatives of the companies, of youth, branch and professional organisations, of educational institutions, of the public administration and leading professionals. The National Action Plan is now officially published on the CSR Europe’s webpage here. Read the document in English here or in Bulgarian here. This is not its final version, but an invitation for partnership and future collaboration. We are looking forward to receiving your additional suggestions and contribution for its realization. Each of the interested stakeholders is welcomed to join the execution of one or more of the actions included in the National plan by filling in an online form here. 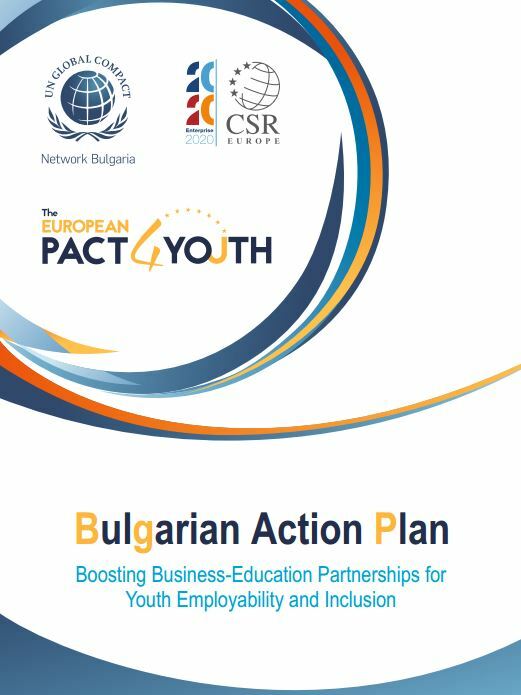 If interested, you can also read the other countries’ National Action Plans on the Pact 4 Youth at the webpage of CSR Europe here. We urge you to give your suggestions, make a commitment and join!